Fully featured backpack for walkers. Adult size. 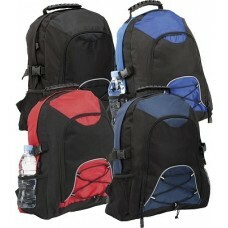 Includes media player socket, elasticated pockets, padded straps, heavy duty carry handle and reflective piping. Tough, lightweight and water resistant 420d ripstop / 600d polyester. Weight used for shipping calculation 1kg (higher than actual weight due to the volumetric weight when packaged).